A collection of David Sedaris's diaries reveal new views of his work and life. In one shining sliver of a moment, David Sedaris’s life, as noted in his new collection of diaries Theft by Finding, intersected with my own. In an entry titled “October 23, 2001, Allentown, Pennsylvania” I see not only my hometown but remember the day Sedaris came on one of his early book tours. When I saw the location of the entry, I cringed, imagining what bland element of the town was so notable that he had to jot it down. Instead, the entry was about a comment made by local hosting professors that had Sedaris laughing harder than he had in ages. With that I happily accepted Sedaris’s one-day perspective on my hometown over the one I built up over 18 years. A funny thing happens when you devour 40 years of someone’s life, recounted day-by-day in simple, intimate terms. The memory of their life starts to take over the present of yours. This can only really happen if the diary achieves the seemingly impossible balance of being authentically written for no one’s enjoyment and still innately enjoyable to the reader. 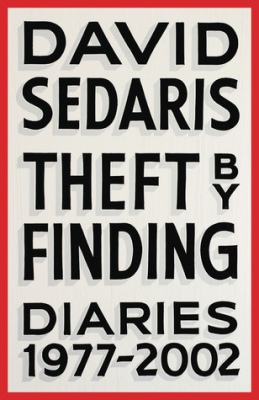 This may not seem surprising for Sedaris fans, who are used to wild and wry stories pulled from his life and family, but the writing in Theft by Finding is a different Sedaris. It’s the DVD commentary to the film we know. Given the absence of extended talk of feelings and emotions, the big events that he did chose to include — the death of his mother, the realization that he’s in love, his sobriety, his first broadcast on the radio — are given as much word count as the stranger he witnessed at his beloved IHOP. For a diary, it isn’t very self-centered. But Sedaris wields a finely-tuned lens; even if it isn’t pointed inward, it is a wonderful way to see the world around him. In the fall of 1985, while a student at the Art Institute of Chicago, Sedaris wrote, “Unfortunately I write like I paint, one corner at a time. I can never step back and see the whole picture. Instead I concentrate on a little square and realize later that it looks nothing like the real live object.” Theft by Finding is certainly a collection of tiny squares that, when taken in together, creates a very real, very alive work of art.